I really love pictures of the Moon. Almost as much as I love looking at the Moon with my own eyes. 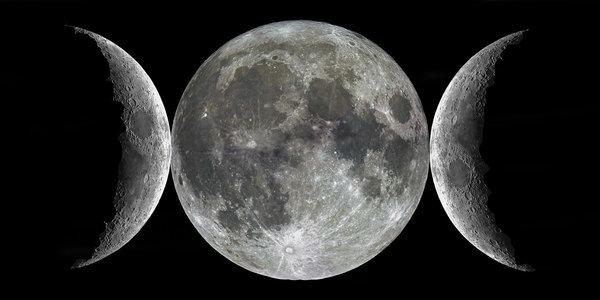 This one is a common triple goddess symbol made from photos of the Moon. The creator was someone called HeroOrMonster. I had to grab it for my files when I saw it. Believe it or not, the neopagan triple goddess of Mother, Maiden, and Crone came after Gerald Gardner. John Halstead wrote some interesting bits about it. One of my favorite summer rituals is the moonbath. Every neopagan should try it at least once.